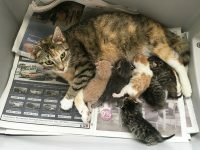 Mammy Kitty and her six wains are amongst our newest arrivals to Waterford SPCA. Mammy and babies were found in an abandoned shed in the city two weeks ago. The kittens were probably about 48 hours old at the time and Kitty, a brave mom was making great efforts to keep them alive in very hot weather. She was starving and dehydrated and readily accepted the comfort of a cardboard box and a drink of water from the rescuer. Now in the “merrion wing” of the foster carer’s home, mother and babies are thriving – see latest video- and will be looking for forever homes later this summer.